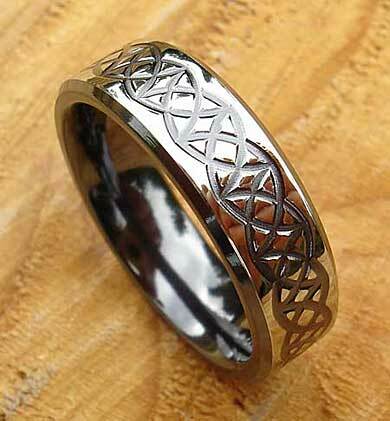 Narrow Celtic Designer Ring : LOVE2HAVE in the UK! We decided to list this narrow Celtic knot designer ring as it matches the wider one in this section also so it is suitable as Celtic ring for women. 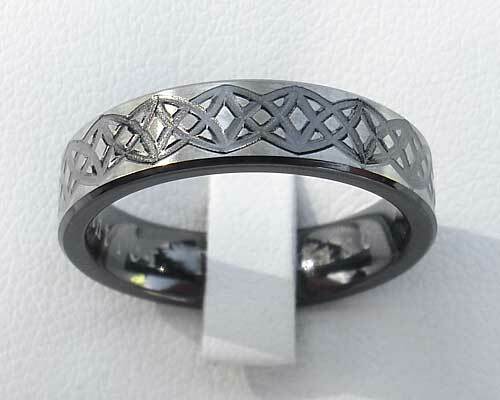 Here we have a black and natural grey Celtic designer ring with a centrally engraved pattern made from zirconium. The ring is 5mm wide and has chamfered black edges. 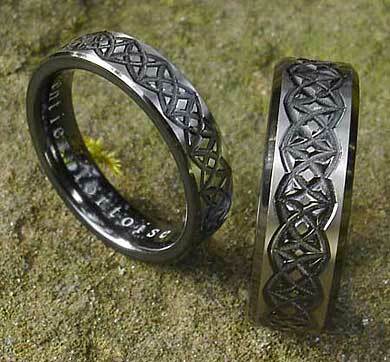 It matches the 7mm version also sold on our website and pictured as some Celtic wedding ring sets below. 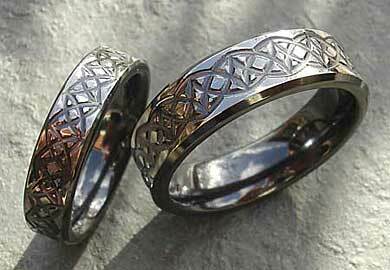 These rings, therefore, make the perfect choice if you are looking for his and hers Celtic wedding rings with a modern design. The outer patterning of this ring is that of an interlaced half circles pattern that repeats around the rings entire outer edge. The patterning is black while the exterior surfacing is grey. This effect, made by skimming away the black surface of the ring, looks magnificent, with the satin version looking like silky velvet and the polished almost mirror-like in appearance. It is hard to choose between the two which is why we have pictured them both in detail on this page. We have further information on this process on our website should you wish to know more. 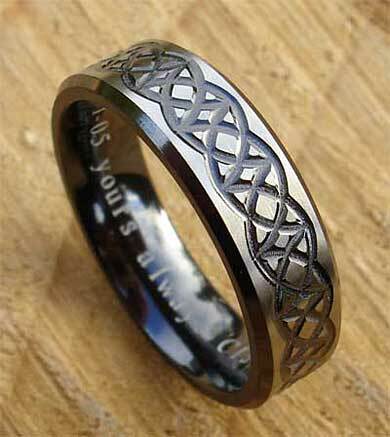 Our zirconium rings with their contemporary Celtic engravings are a real alternative to the more traditional Celtic gold wedding rings we sell as they are very modern in appearance. Zirconium can be finished on all our rings in a polished or a satin finish just like any other metal, and again as mentioned above, we have them pictured as a set on this page to demonstrate this fact.